WebReserv is a highly customizable system that is able to meet the unique needs of many types of businesses. One powerful feature for this is Custom Fields. All types of business benefit from the use of custom fields such as a bed & breakfast establishment, tour operators, bike rentals shops, and many others. The reason is because this tool can be used to define their own fields and give the ability to further customize their booking system to meet the distinct needs of the business. One of the ways to use Custom Fields is if you need to acquire additional information from your customers, such as hotel location, height/weight requirements, or pick up/drop off location. This entry was posted in Custom Fields, General, Tour Bookings and tagged booking system with custom fields, how to setup custom fields, sell additional products, webreserv custom fields. The custom field in the WebReserv booking system is an extremely powerful and versatile feature. We’ve described in the past how you can utilize the custom fields to handle pet fees, lunch baskets and much more (you can see these and other examples here: http://www.webreserv.com/help/). Custom Fields in WebReserv also have a great feature called a display condition. This allows you to specify when the system should display the custom field, based on certain rules. This entry was posted in Booking Calendar, Custom Fields, Tour Bookings and tagged booking system with custom fields, custom fields display condition, how to add a display condition, webreserv custom fields. A typical example where this may be used is if you need additional customer or guest name fields, depending on the number of persons in the reservation. Let’s say that you allow up to 4 guests on the reservation and want to get the customer/guest name for each guest. For the same custom field, scroll down to display rule condition and specify that it should only be shown if number of persons >= 2. Repeat for the remaining guest name fields. After defining the custom fields, you must assign them to one or more products/rooms/rentals. 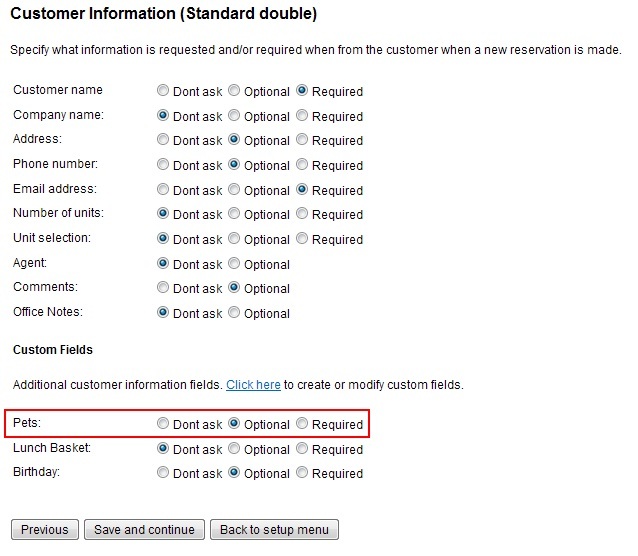 You can assign each custom field separately under Setup – Products & Reservation Rules – [Select Product] – Customer Information. That’s it. The WebReserv booking system will now display the Guest Name 2 only if the number of persons on the reservation is 2 or greater. This entry was posted in Booking Calendar, Custom Fields, Tour Bookings and tagged display condition, webreserv custom fields. The custom fields in the WebReserv booking system makes it really easy to add additional options, such as a pet fees. This example shows you how to create a custom field for pet fees, how to assign it to your room(s) and finally how it will show up on the booking calendar. Step 1. Create the custom field. Go to Setup – Custom Fields and click add new custom field. Select List as the custom field type and click Continue. You are now on the main custom field definition page. – In the name enter “Pets” or a similar name for the custom field. – We allow for a maximum of 2 pets. Since many customers won’t have any pets at all, we’ll enter 3 options in the options field: No Pets, 1 Pet and 2 Pets. 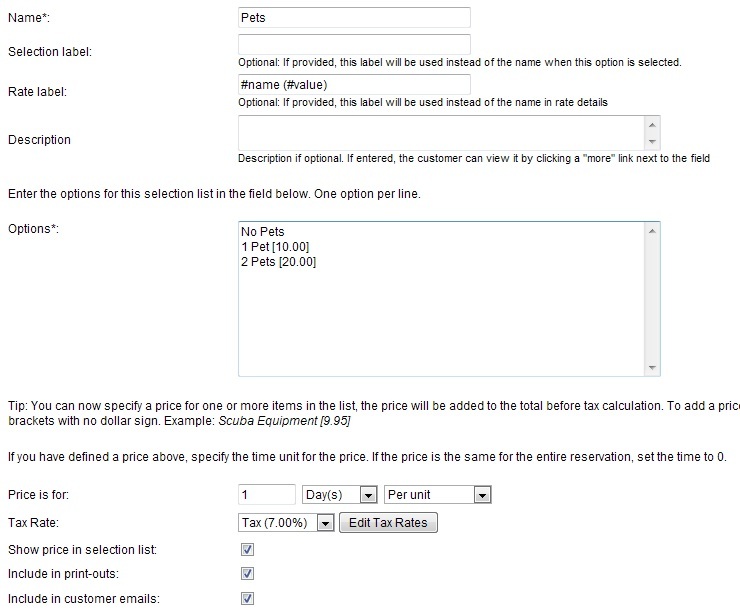 The options field also allow us to enter a price (if selected). In this case we charge $10 per pet per day, so we enter [10.00] on the line for one Pet and [20.00] on the line for two pets. 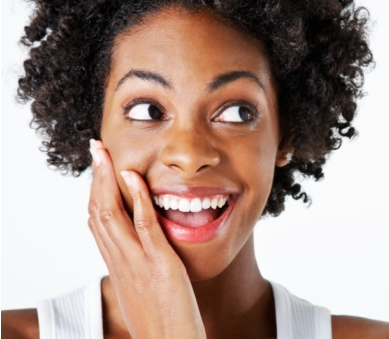 – We also have to specify that the rate is per day. By default, the booking system assumes that the price is for the entire stay, regardless of length. 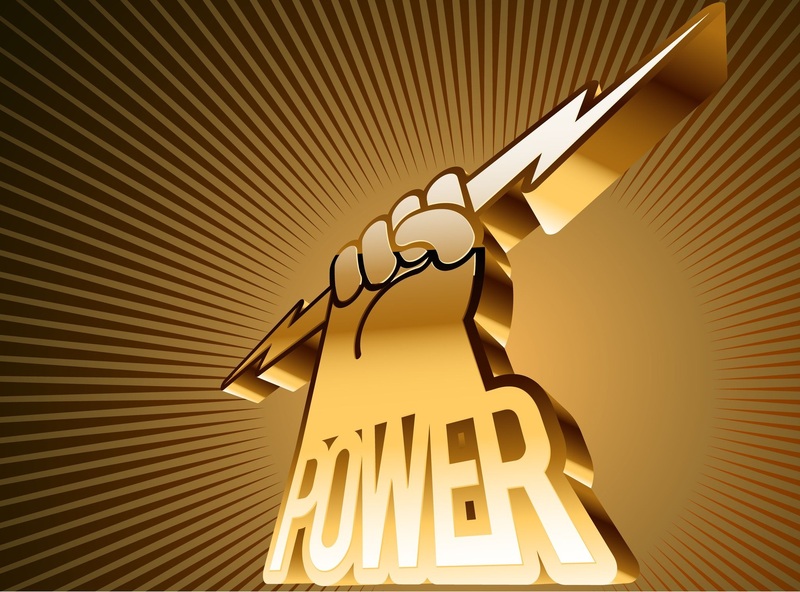 To change the charge to be per day, change the Price is for to be 1 day(s) – per unit. This instructs the system to charge 10 (or 20) per day per room. After saving the custom field, we have to assign it to one or more products/rooms. 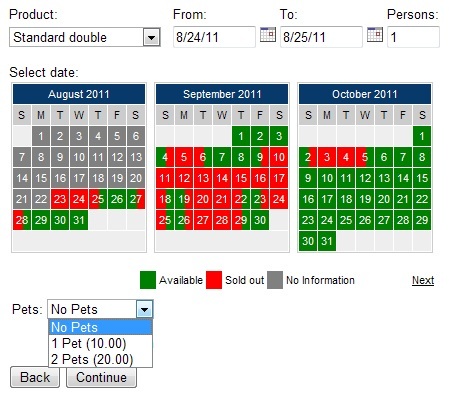 This tells the system to include the Pet custom field on the booking calendar. To go Setup – Products & Reservation rules and select the first product/room where you want the Pets custom field to be included. In the left-hand menu, select Customer Information and scroll down to the bottom. Here you’ll find the custom fields. Set the Pets field to optional. Step 3 – Validate the custom field. To validate that your custom field is working, go to your booking calendar and select the product/room you just modified. Check that the Pets field is included. You are done. That was easy right? Tip: By default, custom fields will show on a separate page called “Additional Requests”. You can group custom fields on the date/time page (as shown in the example above) or you can group custom fields on the customer information page. To modify the custom field groups, go to Setup – Custom Fields and click the link to customize the display order. This entry was posted in Booking Calendar, Custom Fields and tagged adding fees to your bookings, booking system add fees, booking system pet fees, custom fields add fees.